Denville Township is the business hub of Morris County, New Jersey, with a population of 16,635 residents. This quaint gem of Morris County, New Jersey sits at the center of the county and is connected to all of the major transportation routes making travel quick and convenient for residents and visitors alike. Records indicate that settlers began to stake proprietary claims as early back as 1715, forming as an actual Township by the New Jersey Legislature on April 14, 1913, giving Denville Township a very rich history. As a result of this history, Denville Township has some great historical sites and tourist destinations for those interested in good old fashion fun with the family. Knuth Farm is one such site, which hosts events such as “Vintage Baseball,” pumpkin picking, and Christmas tree sales. If hunting and fishing or watersports are things you enjoy, you can rent shacks near nine different lakes situated in and around Denville. And for cheesesteak lovers, the township boasts many great restaurants, most of them specializing in mouthwatering cheesesteak entrees. 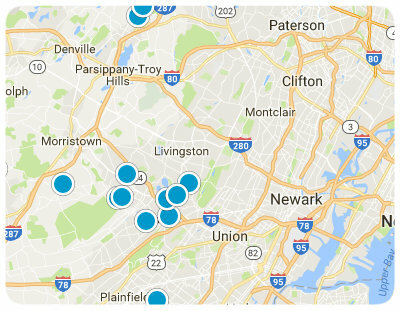 With all of these wonderful amenities and attractions, Denville is a great option for homebuyers of all demographics. Homes for sale in Denville are of varying ages, sizes and architectural styles and come in a broad price range. From rich Georgian style homes, to simple yet handsome American Craftsman homes; from single family homes, to carriage style homes, you can find a wide array of architectural styles in Denville Township. Whether you are a professional, family, empty nester or retiree, your dream home awaits in Denville. Buy a home here and you’ll be in good company. This is a well-educated town, with the citizens of Denville among some of the best educated in the nation. In fact, almost 50% of adults in Denville have a bachelor's degree or above, leaving the average American city with 22%. If you are interested in buying a home in Denville Township, or you have questions regarding the real estate available here, please allow us to assist you and contact us today. GREAT SECOND FLOOR SPACE IN THE HEART OF DENVILLE. 2,000 SQ. FT. RETAIL/OFFICE AVAILABLE FOR IMMEDIATE RENTAL. Approx 4400 sq ft. elevatored building in downtown Denville. Four office condo units. Building sold as a whole, not individual units.Full basement.